The new Arborealis Tree Lighting System is up on Commercial St and just in time for the Summer! The system, formally known as “SynchroTreeCity” from KAPOW! 2015, is an arrangement of custom lights and electronics which produces a beautiful twinkling, cascading, scintillating display of light that moves intelligently between dot-to-dot, limb-to-limb, and tree-to-tree every night from 8m - 2am. When a multitude of simple agents, the discrete illuminated “dots”, work together more complex patterns can “emerge” from the dynamics than could ever be intuited by just observing a single instance. This behavior is seen all throughout nature and even in our modern technological world. It is a theme that is time and scale independent and carries with it a simple yet sophisticated beauty. A way to truly blend the natural and the digital. Thank you so much to the City of Bellingham, Washington for their support, The Whatcom County Association of Realtors and Paula Brown for their economic contributions, as well as the Downtown Bellingham Partnership and Rose Lathrop for their guidance. It is such a pleasure to be able to contribute to the artistic scene in downtown BellinghamMake sure to enjoy a nice snack or drink from Brandywine Kitchen and the Uisce Irish Pub right across the way and take in the view this summer! The Wild Buffalo is a great venue for music and entertainment here in Bellingham. It also features a large stage with ample connections which makes it a great platform for the Sensebellum blend of stage lighting design. 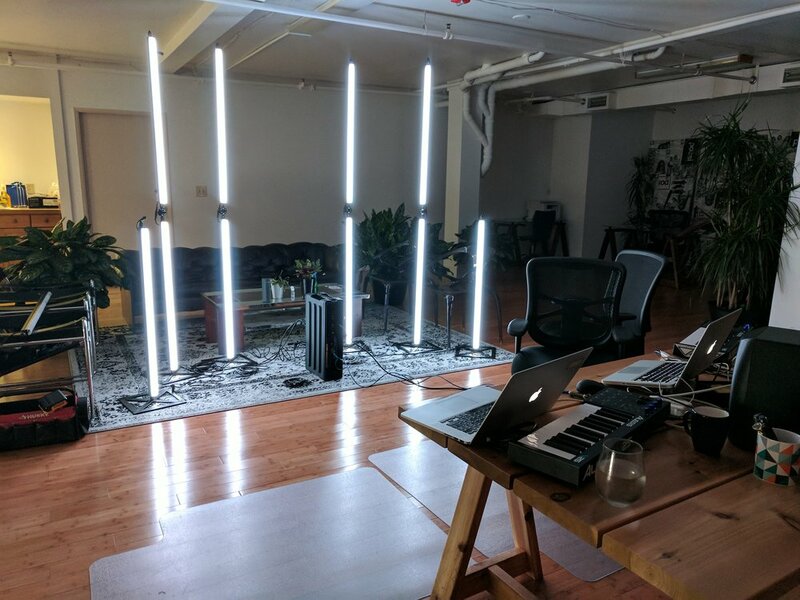 Recently, the opportunity came up to bring out a set of the CUBIX Digital LED Bars with the an assortment of moving head lights and strobes for the show. This looks worked great with the unique electronic sound of the artists - Vindata, Electric Mantis, and Episcool. The Digital LED Bars and the custom steel bases allow for rich color, dynamic patterns, and adds a true 3rd dimension of depth for any stage design. Mix in the moving head beams and some great strobes for good taste and the lights can match any mood, beat, or drop the artists bring out for the night. Looking for some Sensebellum original designs on threads in your size and favorite color? Sensebellum is proud to offer a line of apparel through the online print-on-demand retailer Society6. On the Sensebellum shop you can find all of the classic designs, cuts, colorways, and sizes ready when you are and shipped to your door. Interactive Art Installations and Lighting at the City Arts "Future List Party"
City Arts Magazine definitely has its finger on the pulse of the Seattle arts scene. Every year the team at City Arts organizes the "Future List Party" where they recognize outstanding innovators, leaders, artists, and community members in the area. Part and parcel osf the party is having a good time and in the old Seattle building it certainly is decked out with lots of vendors, activities, music, wonderful people, and, in our case - interactive art! After exploring a few options it was decided that a great way to activate the upper balcony was with a classic combo of the Sandbox of Life augmented reality art installation as well as the Microscopia piece which allows users to peer into the worlds we cannot see! A big thanks goes out to City Arts for the great party once again and all the contestants, winners, and friendly folks who stopped by the art that night. Thank you! Lighting design can be challenging enough on site, with a full van, and many trained hands. However, designing a system that can fly, can be setup in minutes, by band members - and still look drop dead amazing - was a special challenge. Luckily, woking with The Flavr Blue was a dream, literally. They understood what they were looking for and then it was all about piecing it together. Compact. Dialed. Intuitive. Robust. These were some of the design parameters we sought and the outcome is a gorgeous and reliable set of the famous CUBIX Digital LED Bars custom made and fitted with secure luggage and rack mounted solutions. Need a custom solution for your band or ensemble? Lets start the discussion over at the contact page. Conservatories may just be one of the best places to have event lighting, interactive art, music, augmented reality, and projection mapping at night. The Conservatorium at Seattle's Volunteer Park near Capitol Hill really makes this point know. Sensebellum was recently invited out to Lusio Lights and after exploring the whole lineup of the Sensebellum library it was thought best to keep it classic with a Sandbox of Life Installation paired with the Microscopia Installation replete with a selection of truly exotic plants to examine at 400x magnification. The art walk in Pioneer Square, Seattle, is a great scene with a wide variety of galleries and venues opening up their door's every first Thursday. AXIS, a 10,000 sq ft gallery, was nice enough to extend an invite to showcase a variety of Sensebellum original interactive art installations and curious lighting designs into the mix for the opening of the show "Aside Reflections". The space, with its wizened brick, high ceilings, and fish bowl windows make it a great venue to begin with and especially for light art. Pictured here are the CUBIX Digital LED Bars arranged in a nested tetrahedron. In the second picture is the classic, Sandbox of Life, and newcomer, Microscopia. Together they were tied together and a set of the CUBIX Dots which flowed up the ceiling and into a pool on the floor. Lydia Place is an exceptional organization providing emergency and transitional housing for women in the Whatcom County and greater Bellingham, WA area. Sensebellum is proud to have partnered with Lydia Place once again this year for their "Hearts for Housing Gala and Auction Fundraiser" to provide a mix of lighting and projection mapping activations that really transformed the space to another level visually. This year visuals were crafted from hand to match the "Love Boat" theme and were then projected across 200' of wall space in the main hall. Add to this the mix of 3 lobby projection installations and a really enticing moving head light display on the red carpet and the night was a hit. Let us know what Sensebellum can do for your next event over on the contact page!